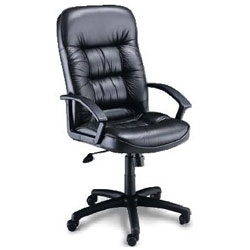 The High Back Executive chair features an overall height range of 44" to 48" and was specifically designed for people over 5'8"tall. It has a swivel/tilt mechanism that provides 360 degree movement and complete tilt tension control. Tension knob and tilt tension lock allow user to adjust resistance for rocking motion. Pneumatic seat height control. 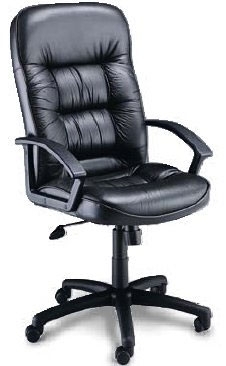 Includes a 26" 5-star nylon base with casters. Chairs meet or exceed ANSI/BIFMA standards. Fully upholstered in luxurious Black leather with matching Black powder cost frame. Some assembly required.